Makes about 5 - 6 sushi rolls (depending on rice quantity per nori sheet) which can either be halved or quartered. Pictured are the halved versions and were taken in Tamar's home just outside of Tokyo during late 2017. 1. After cooking rice, transfer to a container and add 1/2 cup of rice vinegar (pictured) and mix with spoon. Note: It's very important that you use rice vinegar and not any other vinegar. 2. Wait for rice to cool down to room temperature. Cut cucumber lengthways into 1/2" (1 cm) thick pieces. Get your tuna strips / tuna cans drained and ready. 3. 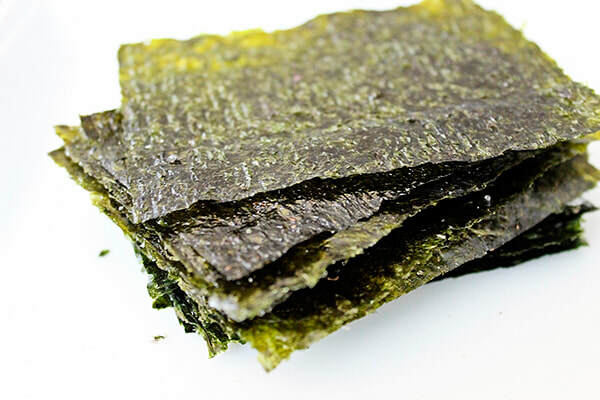 Once sushi rice mixture has cooled, place one nori sheet on the bamboo rolling mat and spread about 1/2 cup on the nori sheet leaving a 1" (2.5cm) space along the far end of the sheet. 4. 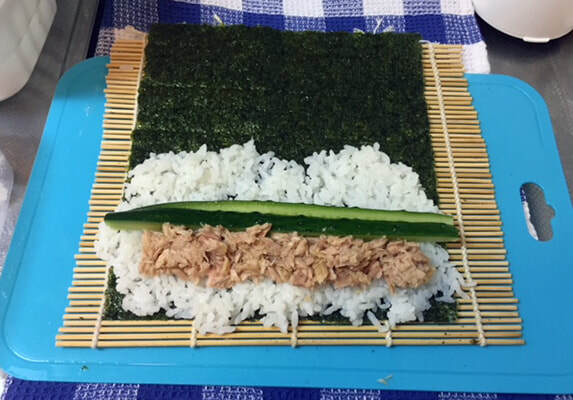 Place cucumber strips and tuna on the middle of rice. Holding the filling down, roll from the front end of the mat away from you, towards the other end. Tighten the rolls and don't be afraid to apply pressure with your fingers. 5. Remove the roll from the mat and halve or quarter or even eat it like a good ol' burrito without cutting! Serve with soy sauce and Wasabi. * Nori (海苔) is the Japanese name for edible seaweed species of the red algae genus Pyropia, including P. yezoensis and P. tenera. 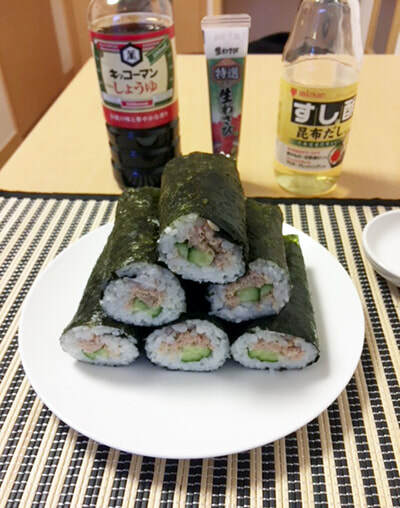 It is used chiefly as an ingredient (wrap) of sushi. Finished products are made by a shredding and rack-drying process that resembles papermaking.